Panning is a photographic technique involving subjects in motion, where the subject is captured crisply but the background becomes a blur. This affect is achieved by moving the camera while taking the picture and matching the motion of the camera with that of the subject. Panning is a technique that requires practice and a steady hand. Some prefer to use a tripod to achieve a smooth movement, but I prefer to handhold the camera, which gives me free range of motion and the flexibility to adapt to the scene as it develops. 'zone focusing' to set a manual focus point. With zone focusing, you choose an object at about the same distance as you expect your subject, set your focus on that object, and turn off autofocus. Your camera will remain focused at that distance, and your subject will be in focus if it is about the same distance away as the object you chose. You can see the blurred foreground outline of the tree that I used to set the focus for these panning shots. For example, in the photograph above, I used a tree in the median to set the focus. Because I used a middle-of-the-range aperture (here, f/8 but the range of f/8 to f/11 works well) I knew that any bike coming down the street would be within the depth of field (area in focus) of the camera. The shutter speed of 1/6th of a second allowed for sufficient blur when moving the camera at the same speed of the biker. A successful panning shot needs a long enough shutter speed to create the background blur. For a slower moving subject, such as a leisurely biker, a shutter speed of 1/20 to 1/6 th of a second will create blur, while with a faster biker you may be able to use a faster shutter like 1/40 or 1/100 th of a second. You can use an even quicker shutter speed for very fast objects like motorbikes, race cars, or fleeing animals. Finding the correct combination of aperture and shutter speed will depend on both the speed of your subject and the lighting. (I recommend keeping your ISO as low as possible, such as ISO 100.) Begin with shutter priority, using the shutter guidelines above, and take a few test shots. If you have a hard time keeping the subject in focus the whole time, try a faster shutter speed. If you have a hard time seeing enough motion blur in the background, try for a longer shutter speed. The trick for panning is that you must be moving the camera at the same relative speed as the subject. 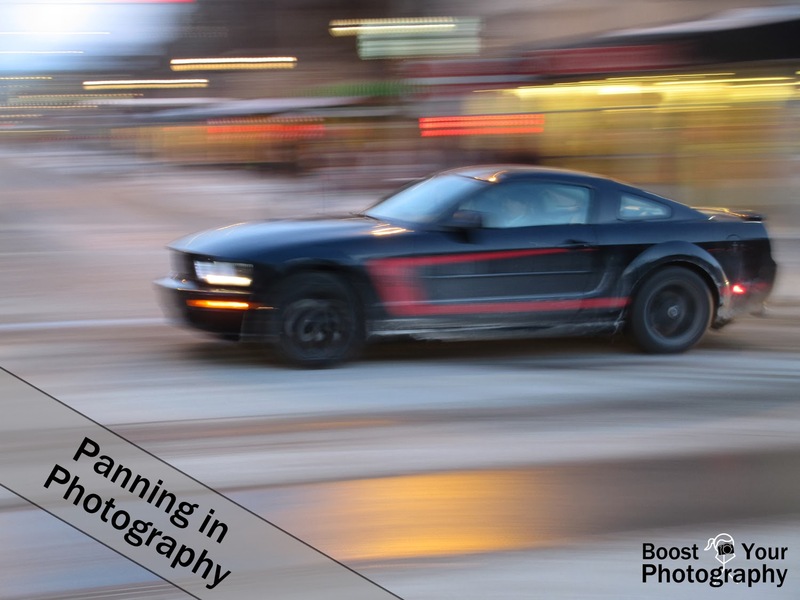 Panning works best for subjects where the movement is perpendicular to your position, such as a car or biker going past on a road, while you are standing facing out across that road. You can also think of it as moving parallel to the plane of the photograph. Panning an object that is moving directly towards or away from you (straight on) is much more difficult. Here, the slight curve to the background motion is because I was 'swooping' the camera rather than smoothly rotating. Another trick for keeping the subject crisp when panning a bicyclist is to find a location where the biker is coasting. If the biker is peddling, the legs will blur, even if you are able to pan the bike crisply. A peddling biker can add to the feeling of motion, but a completely still-looking biker can make the panning effect even more dramatic. Here, panning highlights the contrast between the still and moving bikers. Look for background interest when choosing your location for panning. In the image above, the still biker adds greatly to the feeling of motion when compared to the moving bikers. Bright colors or other contrasts can also add impact to your shot. And that's the nuts and bolts of it. The main thing is to practice. You want to be able to keep your subject in the same place in your viewfinder while moving your camera smoothly. Keep an eye out for biking events or races, which would give you a wide range of subjects and many opportunities to practice. Keep an eye out for interesting subjects!